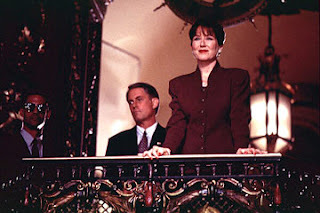 Mary McDonnell began working her way toward the presidential race in 1996, when she worked with her husband Thomas J. Whitmore to save the planet in Independence Day. Remember this? Now she has outlasted her husband (otherwise known as Bill Pullman) and ascended to the top of the ladder. 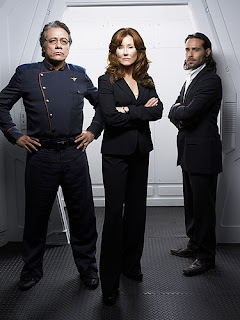 When the colonies are invaded by Cylons in Battlestar Galactica (the reimagined series), McDonnell, the director of education, is the president's successor. 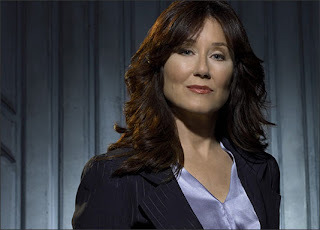 Her name in this series is Laura Roslin. Though Adama and many others are initially against her, the survivors come to embrace Roslin. She wages a fierce war against the Cylons and takes good care of the colonies. She is a strong and selfless leader. She believes in education and health care. And I think it's finally time she moved from First Lady to President. It meant a lot to me, in an embarrassing internet kind of way, to see that I was linked as a person who had your respect and admiration. However, I think that we need to take into account Roslin's willingness rob people of their gods given right to elect their own leader. She's stealing elections now, but what other freedoms will she disregard later? 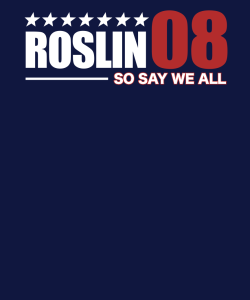 Sure, we may all love Roslin. And yes, push comes to shove, she's who I would want as Commander in Chief...but can she stand before the gibbering horror of...Cthulhu in 2008?